Now, “white trash” doesn’t sound like something that is too appealing to eat, but I’m sure you’ve heard the term used before. Basically, it’s a variety of snack foods (the trash) tossed in delicious melted white chocolate (the white). To make it for Christmas, just add some red and green M&Ms and you’re set! 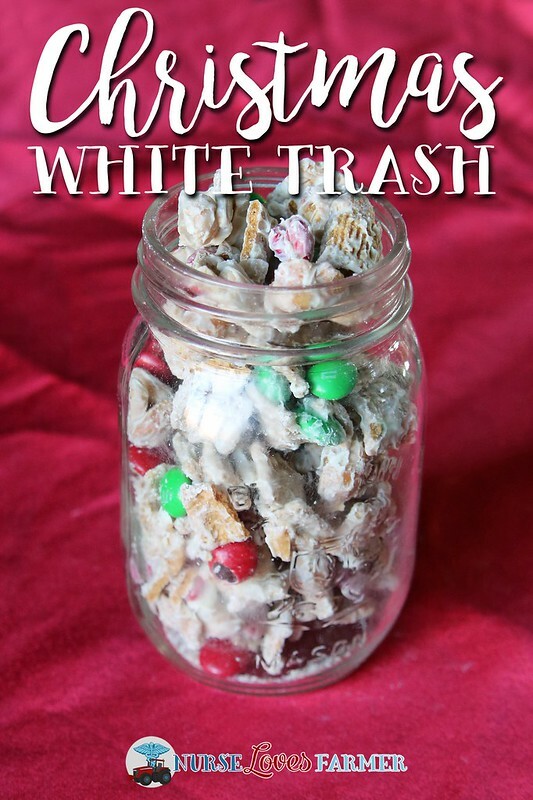 This Christmas White Trash recipe is another that comes from my mother-in-law, and it’s relatively new to the family! I do have a sweet tooth, but I personally find using Golden Grahams makes it a bit too sweet for me, so if you’re looking for a less sweet taste, I recommend using Chex. Buy the honey roasted peanuts in the bulk section to save money, and if you also have white chocolate chips in bulk, 1 package equals approximately 1½ cups which (to me) is the perfect amount. In the video recipe I used closer to 2 cups and it was more chocolatey. 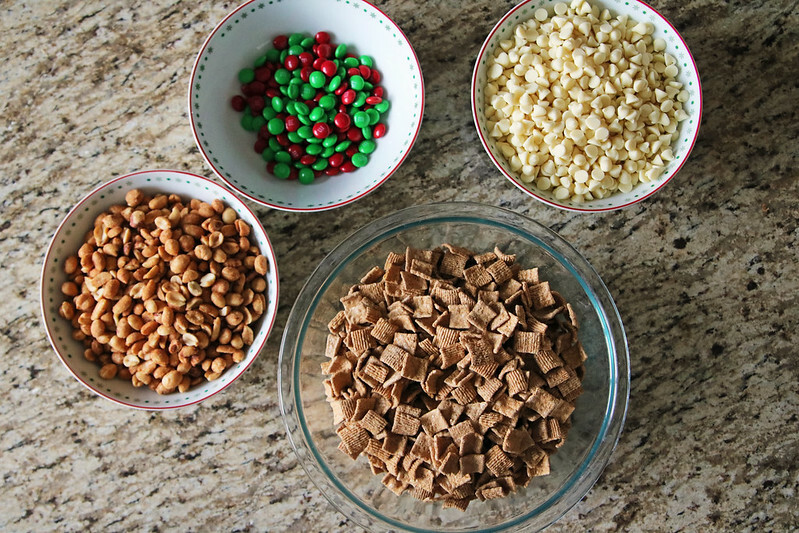 All you need to do is get a large mixing bowl, dump in the cereal, peanuts and M&Ms and melt your white chocolate and mix together. To melt the white chocolate, I placed them in a microwave-safe bowl, microwaved on high for 1 minute, stirred; microwaved for 20 seconds on high, stirred and repeated until the chocolate was nice and smooth. Alternately you can melt in a double boiler on your stove top. Then you just line a cookie sheet with parchment paper, spread out the mixture and wait until the chocolate hardens. Break up and eat! This makes an absolutely wonderful Christmas treat to share with neighbours, teachers, etc. too! 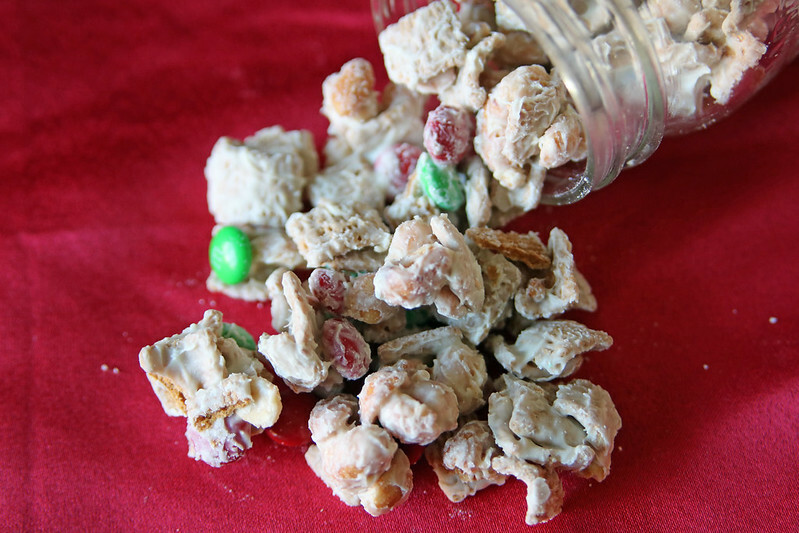 An addictive, no-bake, easy-to-make Christmas treat! 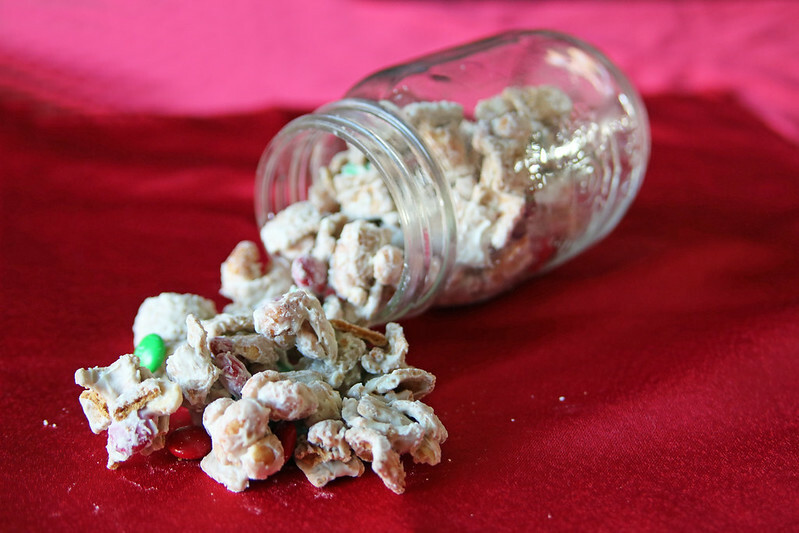 Just toss cereal, honey roasted peanuts, and holiday M&Ms with melted white chocolate! Put cereal, peanuts and M&Ms in a large mixing bowl. Melt white chocolate - I like to do it in a microwave-safe bowl by microwaving on high for 1 minute, stirring and microwaving for 20 seconds and stirring until smooth and melted. Pour white chocolate over mixture, stir thoroughly until all the pieces are coated in chocolate. Line a baking sheet with parchment paper and spread mixture evenly to harden. When hardened, break apart into pieces and enjoy! This is my first attempt at a “Tasty” style video, there’s LOTS of room for improvement, but I hope you enjoy! Will this recipe make a whole lot? My family makes this every year, and a great alternative to the nuts, is mini pretzels or thins, and almonds. Also to mix it up we sometimes use Cinnamon Toast Cereal instead of Golden Grahams. It kind of taste like a Cinnamon Roll! Yummm! Looks yummy! Any thoughts what I could substitute the peanuts for ( peanut allergy in our house), or have do u think they would be good just omitting the nuts? It’s a pretty flexible recipe. Looks yummy! I hope I get to make this for the holidays!